Many years ago, I gave a lecture on the medical humanities at a conference. Pompously, I quoted liberally from Osler, but had never read much of his work at the time. A member of the audience who knew this went out and bought me a copy of Harvey Cushing's The Life of Sir William Osler from a used book store. Somewhat reluctantly, because of its forbidding length, I waded into this thick tome and was swept away by the elegance of both Cushing and Osler's writings. (The book won a Pulitzer Prize in 1926! Not bad for a volume penned by a physician.) You may be interested in perusing these selections for they display much wisdom, humanity and humor. We will publish them in four installments in Cell 2 Soul. My complete notes can be found at http://www.davidelpern.com. P. 81: ...it was at this early period that he began his life-long habit of a half-hour's reading in bed before putting out the light. Most medical students, alas, are too engrossed with their work for such literary pursuits, desirable though they may be. P. 85: In that Trinity of being — of body, mind and soul — which so marvelously make up the Man, each one has its own special ills and diseases. With the first of these — the body — have we here anything to do, leaving the second to be attended to by that class of men whose duty it is 'to minister to minds diseased", i.e. Psychologists, while those of the third class beyond the Physician's skill seek aid elsewhere. P. 116: ...this is what has happened in all ages. Minerva Medica has never had her chief temples in any one country for more than a generation or two. P. 143: [In 1876] his income for the year was $1178, including his professional salary. P. 171: His belief that over-treatment with drugs was one of the medical errors of the day has been hinted at, and it was always one of his favorite axioms that no one individual had done more good to the medical profession than Hahnemann, whose therapeutic methods had demonstrated that the natural tendency of diseases was toward recovery, provided that the patient was decently cared for, properly nursed, and not over-dosed. P. 177: Osler had the greatest contempt for the doctor who made financial gain the first object of his work; and even seemed to go so far as to think that a man could not make more than a bare living and still be an honest and competent physician. P. 181: The first appearance of Egerton Yorrick Davis was in 1880 with "Professional Notes among the Indian Tribes about Gt. Slave Lake, N.W.T." "[this was] pseudo-serious and in a somewhat Rabalesian vein" This man [E.Y.D.] who was first heard of at Fort Desolation in the Great Slave Lake district and subsequently moved to Caughnawauga P.Q. had an interesting and somewhat varied life; From time to time he had a way of unexpectedly bobbing up without proper introduction, to the mystification of the uninitiated. EYD was Osler's alter ego. P. 204: To hand on a book he had enjoyed, either as the volume itself or through a review calling attention to it, became a fixed habit with him. P. 220: [Osler was trying to decide whether he would accept the position at Philadelphia] I finally gave it up as insoluble and decided to leave it to chance. I flipped a four-mark silver piece into he air, "Heads I go to Philadelphia; tails I remain in Montreal". It fell "heads". I went to the telegraph office and wrote to Dr. Mitchell. P. 236-7: Osler breezes were felt everywhere in the old conservative medical centre [University of Pennsylvania] , and yet it was not without some difficulties that he securely established himself. Osler's disinclination for general practice, for which a university position was coveted as a portal of entry, and his determination to limit himself largely to consultations, was mystifying to his medical colleagues, most of whom were accustomed to hold afternoon office hours and to engage actively in house-to-house practice. P. 249: For the crass therapeutic credulity, so widespread today, and upon which our manufacturing chemists wax fat, there is no more potent antidote than the healthy skepticism bred in long study in the post-mortem room. "Once in a ward class there was a big colored man whom he demonstrated as showing all the classical symptoms of croupous pneumonia. The man came to autopsy later. He had no pneumonia, but a chest full of fluid. Dr. Osler seemed delighted, sent especially for all those in his ward class, showed them what a mistake he had made, how it might have been avoided and how careful they should be not to repeat it. In 30 years of practice since then...I remember that case. P. 258: By no means the smallest advantage of our meetings is the promotion of harmony and good fellowship. Medical men, particularly in smaller places, live too much apart and do not see enough of each other.... As a result may come a professional isolation with a corroding influence of a most disastrous nature, converting a genial good fellow in a few years into a bitter old Timon, railing against the practice of medicine in general and his colleagues in particular. As a preventive of such a malady, attendance upon our annual gatherings is absolute, as a cure it is specific. ...he must indeed be a stranger in such meetings as ours who has not felt the glow of sympathy and affection as the hand of a brother worker has been grasped in kindly friendship. P. 294: We speak of death as the King of Terrors, yet how rarely does the act of dying appear to be painful, how rarely do we witness AGONY in the last hours. Strict, indeed, is the fell sergeant in his arrest, but few feel the iron grip; the hard process of nature's law is for most of us mercifully effected, and death, like birth, is "but a sleep and a forgetting". etc. etc. excellent. P. 301: Literature has often been enriched by those who have deserted medicine for the muses. But to drink deep draughts at Peirian springs unfits and when the thirst is truly divine should unfit a man for the worrying rounds of practice. It is shocking to think had Goldsmith secured the confidence of the old women in Bankside, Southwark, we should probably never have known the Vicar, Olivia or Tony Lumpkin. Still worse, to think of what we should have lost had Keats passed on from a successful career at Guy's to obtain even a distinguished position as a London Surgeon! Happily, such men soon kick free from the traces in which the average doctor trots to success. P. 310: ...he helped some of us to do a little thinking. At length, after the fashion of the nautilus, he builded a more stately mansion and left us [for JHH]. We would have fain kept him; but that could not be. P. 311: (Councilman) He [Osler] was then not quite forty and looked younger, a well-knit but rather spare figure, of about average height, a rather long moustache, the position at the ends of which seemed to vary with his mood; hair even then a little spare, a clear but sallow complexion, a broad forehead, good eyes and a lively expression. P. 324: ...whenever there were "colds" about he was almost certain to be victimized and it became his custom to surrender immediately, to remain in bed for a day or two and to saturate himself with literature in lieu of drugs. "Given the sacred hunger and proper preliminary training, the student-practitioner requires at least three things with which to stimulate and maintain his education, a note-book, a library and a quinquennial brain dusting. I wish I had time to speak of the value of note-taking. You can do nothing as a student in practice without it. Carry a small note-book which will fit into your waistcoat pocket, and never ask a new patient a question without note-book and pencil in hand.... Begin early to make a three-fold category — clear cases, doubtful cases and mistakes. And learn to play the game fair, no self-deception, no shrinking from the truth; mercy and consideration for the other man, but none for yourself, upon whom you have to keep an incessant watch. You remember Lincoln's famous mot about the impossibility of fooling all of the people all of the time. It does not hold good for the individual, who can fool himself to his heart's content all of the time. If necessary, be cruel; use the knife and the cautery to cure the intumescence and moral necrosis which you feel in the posterior parietal region.... It is only by getting your cases grouped in this way that you can make any real progress in your post-collegiate education; only in this way you gain wisdom with experience. P. 340: His only weak spot was in therapeutics, if a healthy skepticism concerning drugs may be regarded as a weakness. P. 342: "the desire to take medicine is perhaps the greatest feature which distinguishes man from animals". Of one thing I must complain — that when we have gradually emancipated ourselves from a routine administration of nauseous mixtures on every possible occasion, and when we are able to say, without fear of dismissal, that a little more exercise, a little less food, and a little less tobacco and alcohol, may possibly meet the indications of the case — I say it is a just cause for complaint that when we, the priests, have left the worship of Baal, and have deserted the groves and high places, and have sworn allegiance to the true god of science, that you, the people, should wander off after all manner of idols, and delight more than ever in the hands of advertising quacks. But for a time it must be so. This is yet the childhood of the world, and a supine credulity is still the most charming characteristic of man. P. 344: The study of the phenomena of disease without books is to sail an uncharted sea, while to study books without patients is not to go to sea at all.... For the general practitioner a well-used library is one of the few correctives of the premature senility which is so apt to overtake him. Self-centered, self- taught, he leads a solitary life, and unless his everyday experience is controlled by careful reading or by the attrition of a medical society it soon ceases to be of the slightest value and becomes a mere accretion of isolated facts, without correlation. It is astonishing with how little reading a doctor can practice medicine, but it is not astonishing how badly he may do it. 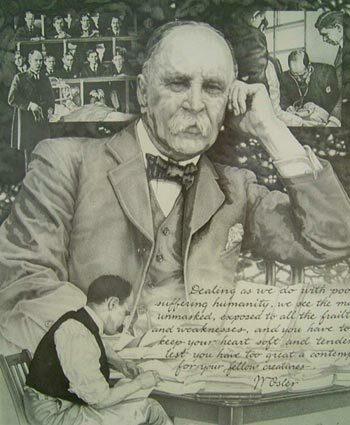 P. 349: He [Osler] asked me if I would loan him the use of my library for an hour or so in the mornings. The first morning he appeared with one book under his arm...and so on for the next two weeks, so that the table and all the chairs and the sofa and the piano and even the floor was covered with open books. As a consequence I never was able to use the room for fully six months. P. 367: From one who has passed la crise de quarante ans...with most of us this physical change has its mental equivalent, not necessarily accompanied by loss of the powers of application or of judgment; on the contrary, often the mind grows clearer and the memory more retentive, but the change is seen in weakened receptivity and in an inability to adapt oneself to an altered intellectual environment.... The only safeguard in the teacher against this lamentable condition is to live in and with the third decade, in company with the younger, more receptive and progressive minds. So much of the daily life of a civilized community relates to problems of health and disease that the great writers of every age of necessity throw an important sidelight not only on the opinions of the people on these questions, but often on the condition of special knowledge in various branches. Thus, a considerable literature already illustrates the medical knowledge of Shakespeare, from whose doctors, apothecaries, and mad-folk may be gathered as to the state of the profession in the latter part of the 16th century. [He goes on to speak of Moliere, and G. Eliot] and a character such as Lydgate, the little everyday details of the struggles and aspirations of the [medical] profession of the 19th century, of which we find no account in the pages of the Lancet. P. 395: He pointed out, also, that permanence of residence, good undoubtedly for the pocket, is not always best for wide mental vision in the physician....[Browne] "Fortunate it is for you that the service in one place is never long enough to let the roots strike so deeply as to make the process of transplantation too painful. Myself a peripatetic, I know what it is to bear the scars of parting from comrades and friends, scars which sometimes ache as the memories recur of the days which have flown and of the old familiar faces which have gone." P. 408: He does not spare the physician who "without physiology and chemistry flounders along in an aimless fashion, never able to gain any accurate conception of disease, practicing a sort of pop-gun pharmacy, hitting now the malady and again the patient, he himself not knowing which." P. 425: A consultant's life is not without unpleasant feature, chief among which is the passing of judgments on the unhappy incurables — on the cancerous, ataxics and the paralytics, who wander from one city to another. Few are able to receive the balm of truth, but now and again one meets with a cheery, brave fellow who insists upon a plain, unvarnished statement of his prospects. P. 435: Humanity has but three great enemies: fever, famine and war; and of these by far the greatest, by far the most terrible is fever.